Monte Cristo Casserole Recipe Using French Toast! This Monte Cristo Casserole recipe was a popular brunch recipe at our Make Ahead Meal Store. It’s inspired by a popular dish at Bennigan’s! They have a sandwich with ham, turkey and cheese that is fried and topped with a raspberry sauce…it’s indulgent. Spoiler alert! This is not our typical healthy, low-carb brunch recipe like Ham Quiche Cups or Crustless Quiche. It’s absolutely delicious just like a Monte Cristo Grilled Cheese Sandwich, but so much easier to make because it starts with pre-made French Toast. It’s perfect for a special occasion like Mother’s Day, an anniversary or around the big holidays like Christmas or Easter. And, it’s sure to wow! In this version, deli meats and Swiss cheese are mixed with frozen cinnamon French toast sticks that have been cubed, which is a big time-saver. 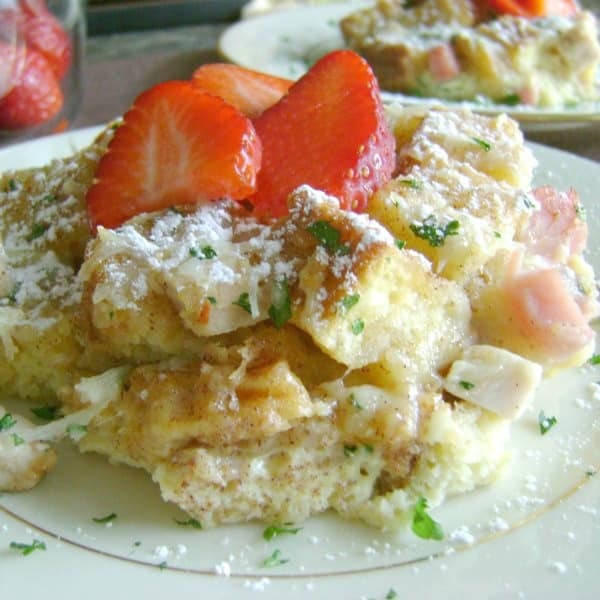 Everything bakes in a creamy egg mixture and the dish is finished with powdery confectioner’s sugar and fresh strawberries. 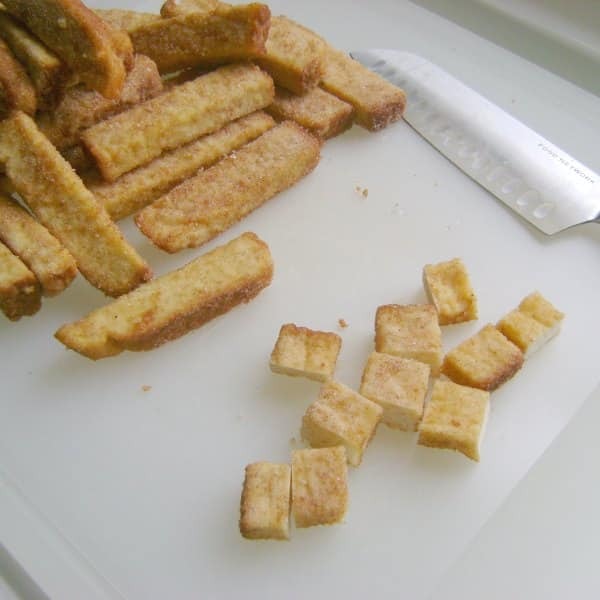 To begin, cube a 20 ounce box of frozen French toast sticks. No need to defrost them first. Next, cube 1 cup each of ham and turkey. I usually ask for a 1/4 inch thick slice from the deli counter. Shred 1 cup of Swiss cheese. Chop about 2 Tablespoons of fresh parsley…it adds color, flavor and perhaps a little good luck. Did you know dishes in Italy are blessed with a sprinkling of parsley dust? Yes sir, according to Chef Meg at SparkRecipes. Watch her chop fresh parsley in this video. You can never have enough blessings! Layer everything in a baking dish. 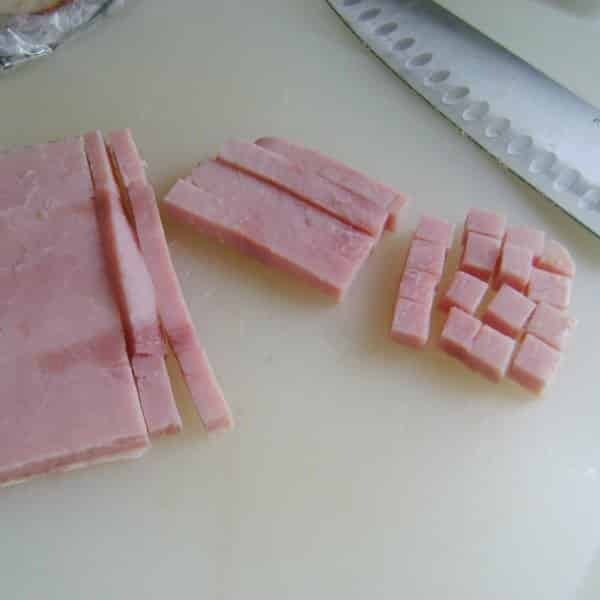 Don’t stir or toss the mixture…if you do, the ham, turkey and cheese will plunge to the bottom. Whisk the eggs and milk in a bowl and evenly pour the egg mixture over the top. Bake, uncovered, in a 350 degree oven for about 30 minutes or until the egg sets. The house will smell wonderful at this point and you may want to dive right in. Resist. It’s best to wait about 10 minutes before serving so everything settles and firms up. While you are waiting, hull and slice the strawberries. Some people may want to top it with a little strawberry freezer jam or with a different fruit entirely…blueberry compote anyone? Isn’t it gorgeous topped with powder sugar, fresh strawberries and a little chopped parsley? Serve it on your best china and enjoy! Note: This recipe was originally posted in February 2013 and has been updated with nutritional estimates. CLICK HERE TO PIN NOW! Please rate the recipe and #DinnerMom or @DinnerMom on social media. We love to see what you are cooking up! This Monte Cristo Casserole recipe is inspired by the popular Bennigan's sandwich. But, this dish is easy to make and perfect for a special brunch or breakfast. Popular recipe from our Make Ahead Meal Store that can be made ahead and frozen. Prepare French toast sticks, ham, turkey, Swiss cheese and parsley as indicated in the ingredient list. Layer the first 5 ingredients in a 9 x 12 baking dish in the order listed. Whisk eggs and milk in a bowl. Evenly pour egg mixture over ingredients in the baking dish. Bake, uncovered, for 30 minutes or until egg mixture sets. Remove from oven and allow casserole to rest for 10 minutes before serving. Top with powdered sugar and strawberries. Don't need 8 servings? No problem. Split the ingredients in half. 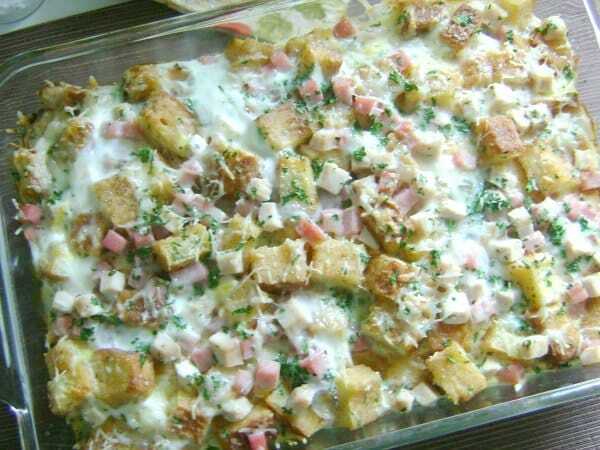 This casserole can be made ahead and frozen. Store in the freezer for up to 2 months for best results. Thaw in refrigerator for about 24 hours before cooking. Another one of my favorite meals from the store! 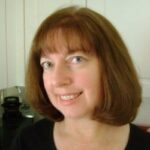 I so happy I found your website!! Thanks Laura! I’m slowly getting them added along with a lot of other things too! 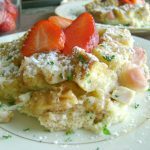 I love Monte Cristos and this was such a fun way to mix them up a bit, nothing beats an easy breakfast casserole! Totally agree! We make this up ahead of time so there’s absolutely no stress. This looks to die for!! I’m a huge monte cristo fan so I can see me inhaling this. It definitely doesn’t last long when we make it!